By the time of his release I was in boarding school. Senior year. Reagan was steamrolling toward reelection. Most of my classmates had an eye on the future. They filled out applications to colleges. They have families now, careers, houses. I smoked bong hits and listened to songs from the era of the Two Freaks. In the summer of 1985, while Jerry Augustine was adjusting to a new life outside the major leagues, I began filling up notebooks with words. The first thing I wrote about, I think, was my expulsion from boarding school, which had happened a couple months earlier. I couldn’t get it right. The words weren’t capturing the moment. I kept at it though. I’ve been at it for twenty-three years. Where has it gotten me? No money in the bank. Precariously employed. I haven’t really roamed the land that much, not in the Kerouckian sense that I might have hoped for when I was writing my first thick-tongued notebook prayers twenty-three years ago, but I don’t have any roots either. Jerry Augustine has roots. He played his entire career for the team in his home state. When done he started an insurance agency in Milwaukee, and later he became a college coach in that city. He’s a beloved coach, a trusted insurer, a father of five. I have started to understand that having a family, being a father, is probably beyond my capabilities. I can barely take care of myself. The stress of keeping myself clothed and fed is more than enough. The older I get the weaker I feel, and the more anxious I get about the uncertainty of daily life, even little things like finding a parking spot or calling the phone company, my stomach aching like there’s a corrosive zero inside me, growing bigger and bigger. I always vaguely figured I’d have kids and be a Normal Guy. I’d play catch with them, give them some advice, eventually cling to them with my skeletal liver-spotted hands when death comes to claim me. But the truth is even without kids I feel uneasy and nervous, like I’m on the mound, all alone, about to single-handedly blow a huge lead. But at least now the stadium is pretty empty. Who needs more asses in the seats? Who needs anyone counting on me? 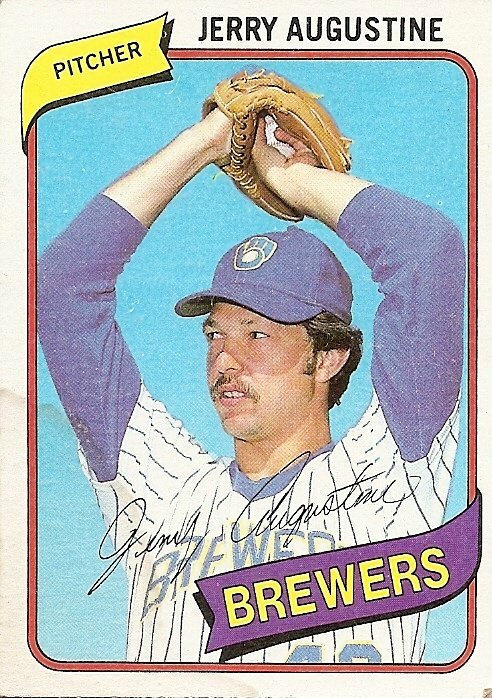 But back to this 1980 card. I got it when I was 12 and everything was still a hypothetical for me. Judging from the faint stain in the lower left-hand corner of the card, I must have looked at it for a while, long enough to spill something on it. Maybe I was drawn to the tremor Jerry Augustine’s expression provides to the card, the slight aberration of his sideways glance in the otherwise sky blue idyll. Maybe I sensed the disappearance of a wider, shaggier world, a world that had visible rips in the fabric, other worlds leaking through. The Two Freaks believed normal everyday existence is a veil. They tried to be the loose strands, the beginning of an unraveling. After a while they gave up, disappeared into government jobs. I saw one of them behind the counter at the post office not so long ago, gray hair in a ponytail. I was waiting in line to mail a piece of writing that would later be rejected. He was wearing a uniform and tending to customer demands with institutional slowness. He seemed to have developed a facial tic. A tremor. A loose thread in the veil. 1. I wouldn’t put anything past your capabilities, Josh. 2. Once again, a great piece of writing. Paragraph 6 hit home for me as I have been having the same exact thoughts of recent – you expressed it much better than I cold hope to. 3. This is my favorite one so far… When you write the book, I would love to help with the cover. 4. You should have kids, if only because your storytelling is tremendous. Stephen King stuck his rejection letters to a wall. He stuck a lot of letters to the wall. He needed to get a bigger bolt to hold all the rejection letters to the wall. FWIW, I think your stories, like this one, capture an audience as much as King does with his audience. 6. I prefer to think the Freak with the recorder was sitting in the bleachers playing Bob Dylan’s “I Dreamed I Saw St. Augustine,” and this has completely befuddled Jerry. 7. 1 – 4 : Thanks for the kind words! I appreciate it. 5 : Uncle I can do. 6 : I think you’re right. 8. I felt the same way. My son was born, and I realized I could carry that load because when he was a baby I saw myself in his eyes. Cheesy? Yes. True? Even more so. But still, from time to time, I always wonder if I was ever cut out to be responsible enough to be a good father. I saw Auggie in full uniform at Miller a couple weeks ago throwing BP to a bunch of dying Brewer bats. My kid and I politely shouted from the right field bleachers to toss us a ball, and he ignored us. That’s ok, we were rebuffed by Sabathia, Mota, and Vinny Rottino before him. My son later told me I was more of a hero to him than those guys, anyway. I guess I’m not doing such a bad job after all….